Posted February 12, 2018 by admin_gentimber & filed under Uncategorized. So, you’ve finally installed the fence of your dreams on your property. Congratulations! You may now go on permanent vacation. No worries right? Wrong! Just like a home, boat, car, or any other major investment of any kind, your most important investments will not maintain themselves, will they? A new fence line is no different! It is your job to make certain you care for your valuable additions to your farm or residence. What must I do that hasn’t already be done? Actually, taking care of your fence only requires a small amount of good common sense mixed with some good, old-fashioned elbow grease. Yes, it does require your time and effort, but you’ll sleep better at night knowing your fence is properly maintained and will serve you and your valuable livestock for years to come. Keeping your fencing nicely trimmed and free of weeds and overgrowth is the first order of the day. Simply mowing the perimeter and either spraying or weed eating around the fence posts and bottom rails will go a long way in keeping your fence up to snuff. A well-maintained fence line says a lot about you and your property! How are your boards, rails, and wire holding up? A brisk walk or golf cart ride around the perimeter with a roll of brightly colored flagging tape to mark trouble spots that need immediate attention is all that is needed. The next step is to straighten up that leaning post, nail in those nails that have worked loose, or replace a cracked or broken board. All these things will assure you that your animals and property are safely protected. At some point in the life of your fence, you may want to consider a good coat of paint to add weather protection and bring back its original beauty. While this maintenance is an additional cost, it will pay off in the long run for you. It’s a good idea to kill any mildew that may be growing on your fence before the painting is done with a half and half mixture of Clorox and water. If you cannot find the time or energy to do all these things yourself- never fear! Visit www.generaltimber.net to find a list of fencing contractors that are more than happy to do so or simply call us and we will put you in touch with them. In closing, remember this…a well-kept fence will always keep you well! Posted April 1, 2016 by admin_gentimber & filed under Agricultural Fencing, blog, Creosote, Horse Fencing, Uncategorized. There may not be a more beautiful sight- that image of a meandering fence line gently cresting a hill and gracefully rolling over into a green valley. A fence line is more than just a boundary of protection- it is like the frame is to a picture, and that picture is of your farm! One cannot stop their eyes from following a fence line that perfectly flows with the contour of the land. It is indeed pleasing to the eye, but not just anyone can turn a plain fence job into an inspiring work of art- and no two pieces of property are ever the same. Some land is flat as a pancake and easily fenced, other regions are full of varying elevations that make a fencer’s job more difficult. Hiring the right fence contractor to make your farm as attractive and functional as it can be is paramount. A fence is a permanent fixture, a long-term investment that you will be looking at for years and years. This it is why it is so important that a farm finds the right contractor to install its fencing. One of the best ways to get the job you want is to ask the prospective fence contractor to provide a portfolio of their work so you can see for yourself. Ask to see the farms where the lay of the land closely resembles your farm layout. They say- “a picture says a thousand words” and in this case, they are exactly right. A fence that is erected properly cannot lie to your eyes and should produce an excellent first impression as someone enters your property. If you plan to install your own fencing- this is when it is necessary to order an extra load of patience along with your fence posts and rails. If it were as easy as digging a hole and dropping in a post and make it look great- everyone could do it! The layout strings that stake out your intended fence lines must be exactly as you want them before your fencing project can begin. Where your string goes your fence line follows. Aside from quality treated wood products, determining and exacting your layout lines is the most important decision you’ll make before erecting your fence. The spacing of your posts and the actual post heights are also critical. This is not an article of ‘how to’ put up your fence as much as it is how to deal with the un-level ground. Fence post heights must be adjusted by pulling them up or tamping them deeper into the soil. This is when someone with a good ‘eye’ will ‘eyeball’ the top board and make certain it is following the lay of the land. You simply cannot use a predetermined post height and roll with it throughout the job- unless you are fortunate to have nearly level property. Eying the top board or rail as you slowly install your fence will make certain your job is pleasing visually. Keep in mind- not everyone is good at this procedure. Tightly ‘tamping’ your posts or setting them up in concrete will also assure you that the good work you did will stay in place for the long haul. This is only done after you have leveled and plumbed your post and made certain it is at the desired fence height. Mistakes made at this point cost time and money. If your fence post is too high you can always cut it off- but if it is too low, this means pulling the post out of the ground and starting over. No, putting up a fence is not rocket science, but it does take experience and a great deal of patience. Again, hiring a knowledgeable fence contractor will all but eliminate these kinds of costs. Ultimately it is your money to spend as you wish- but a novice can rarely match the workmanship of a full-time fencer who has the eye to do the job right the first time. Posted March 15, 2016 by admin_gentimber & filed under Agricultural Fencing, Horse Fencing. Okay, I received a random question yesterday from a potential client that went like this- “Typically, how high should one build a horse fence?” This was and still is a very good question, and is a topic that should be addressed before you dive into your farm fencing project this spring. After nearly 30 years in the animal control fencing arena (yes- that is a play on words, sorry), I’ve seen just about every kind of animal enclosure under the sun. Horses are not the only animals on the farm these days. Exotic game and the other colorful varieties of animals I encounter each year never ceases to amaze me. This is what makes it interesting and even fun to be in this line of work- you never know what you may run into- or be running from! Yikes!! Llamas can be very territorial and can spit further than you might think! Back to the original question- Just how high should one erect an equestrian style fence? The industry standard is a mere forty-eight inches. Yes- you heard me right! Four feet sounds impossibly low for these majestic creatures that can gallop and leap like Olympic athletes. But it is true, horses are quite visual and from what I have learned from their owners who care for them year round- they learn to respect their perimeter barriers that separates them from the dangers of the outside world. Besides, they are getting treated like kings and queens on the right side of the fence. Larger horses naturally need fences a few inches taller. I’ve seen them as high as fifty-two to fifty-four inches off the ground. This gives the fence room for an additional board or rail to create a better visual for these gentle giants. 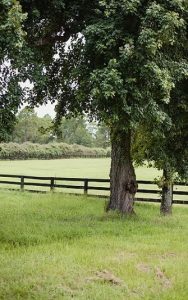 Fences that are four feet tall are typically of the three rail or three board variety- and you will find that nearly all horse-wire distributors sell their standard field fence wire at the 48 inch mark. This is not to say that you cannot order specialty wire at a greater height for more security. So the answer to the question is not always going to be the same; it will, in fact, be dictated by what you are trying to keep in and what you are trying to keep out! 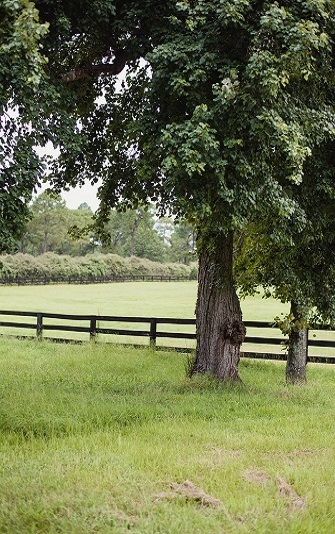 Lots of horse farms utilize a ‘dual purpose’ fence that incorporates wood and wire for two reasons: one, the board at the top gives the ‘visual effect’ needed to gain the horses attention- secondly, the wire is usually put over or under the boards to help keep unwanted critters out- like a rabid possum or fox, for example. These dual purpose specialty fences are almost always built to a height of 48 inches. The best answer to the fence height question in my 30 years in the field is: A horse fence should be built to a minimum of 48 inches to contain and keep your horses safe and deliver you a good night’s sleep. Keep in mind this is a ‘standard’ and is certainly not chiseled in stone. Horse fence can be custom built to meet the needs of the many breeds, but think higher price along with a higher post top.